Hell hath no fury like a special needs parent scorned. But as mad, sad, disheartened and frustrated as you may feel about the appointment of Betsy DeVos as education secretary, as worried as you may be about the future of your child's education, your voice still matters—now, more than ever. So, yeah, she doesn't have experience working in public education. And she doesn't seem to have a handle on the Individuals with Disabilities Education Act (IDEA), the federal law that ensures students with a disability are provided with a free and appropriate public education in the least restrictive environment. Before the law came along in 1975, states did not have a good record of making education accessible to students with disabilities. At her confirmation hearing, DeVos said that enforcing IDEA is "a matter best left to the states." But wringing our hands isn't going to do anything for our kids, as we well know by now. What we can do: school Betsy DeVos on how important IDEA is to students with special needs. We can let her know just how much our children have benefitted from the education they've received. We can tell her about the battles big and small that we have fought, even with the law on our side, to get our children what they need and deserve. We can tell her all about our children's potential and the amazing feats of learning they have achieved like my boy Max, who had brain damage so severe at birth doctors said we could sign a Do Not Resuscitate and who is now reading thanks to his teachers' attention and nurturing. Oh, yes: We can make sure she knows. • Call her family foundation at 616-643-4700. Or message her via this contact form. 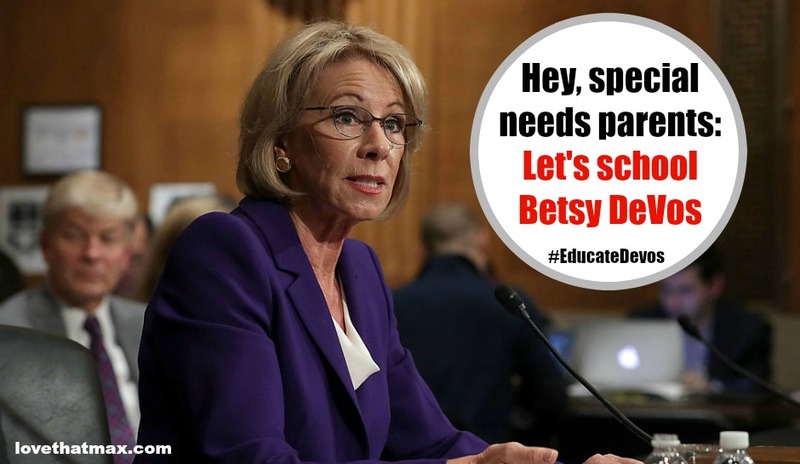 • Leave a comment on DeVos's Facebook page. • Email the US Department of Education's headquarters (well, assuming it doesn't get abolished) and specify that you want your comments added to the common database. Messages are forwarded to senior officials in the department. Email answers@ed.gov — or call 800-872-5327, press 3 and speak with a representative. One good morale booster: Consider a donation to DonorsChoose.org, where you can help fund a classroom project in a high-need community. Cruz and Cornyn (Texas Senators) didn't just not listen to constituents they shut down their phones (this number cannot be reached at this time), left voice mail boxes full, and refused to allow constituents into their office. Cornyn then had the audacity to post a plea for money on his face book page. He is getting ROASTED. https://www.facebook.com/johncornyn/posts/941301309304303?comment_id=415426348798123&notif_t=like&notif_id=1486518892201993 Hopefully we can replace Cruz with Wendy Davis next year. Wendy Davis replacing Cruz would be amazing. Shame on them. Is it even legal for a senator to bar constituents from his office? On it! And also very happily, and repeatedly, giving Jeff Flake a piece of my mind by all contact methods. She could have been a hamster, but, in his words, she "had him at school choice years ago". Grrrrr. Yeah, I saw that. Lovely. Grrrr...There are constructive conversations to have about school choice. Betsy DeVos doesn't have them. Still, we should make our voices heard. And see how it goes (because we have no other choice). This is a worrisome time, yes. But consider all the good you are going to do for children out there. OTs have made a tremendous difference in Max's life. Props to you! Nice piece. My son is no longer in school but when he was IDEA was so important in getting him the services and education he needed. We fought all the way but IDEA was there with us. I worry about other children now. We have a line of art images that we do together (Two Can Art) that are on products and a % is going to autism organizations right in our community so I know we are helping other families. Thanks so much for posting this I will do what I can to help other families I worry that they are talking about shutting down the entire department of Ed. and what that could mean. I think parents of special need kids are strong and know how to advocate. Our voices are a force to be reckoned with. Amen, Patti. Dismantling the Department of Education has been proposed over the years because some feel it's better for education policy to be decided at state/local levels. It seems worrisome for our kids because before IDEA came along, as you probably well know, they often received dismal school treatment. Here's a thought. Why don't the groups representing special needs children such as Federation for Children with Special Needs, Autism Speaks, National Association for the Gifted, etc...get together and create a consensus of needs that are not currently being met and concerns with changing IDEA or granting IDEA authority to the state. Then these groups could schedule a meeting with Betty Devos to discuss this list. This would be far more powerful and far reaching that a bunch of individual voices saying different things. The bright side is that this administration is open for change and there is a lot of things that need to change. A coalition of groups representing children with special needs that could meet with DeVos is an outstanding idea. The Arc would be another good one to include. I am going to ask a contact of mine about this—I wonder if there's already any such effort in the works. Thank you. This is a great idea. Please keep us updated if you find out anything! Also on your Senators that didn't listen to their constituents is Alaska's Dan Sullivan. Thousands and thousands contacted him to ask him to vote no while only a handful asked him to vote yes. Also - Did anyone else notice that the idea.ed.gov site is now shut down??? I'd only listed senators up for reelection in 2018... You can not vote for him in 2020! idea.ed.gov was not shut down, they had server issues and it is back up. How did you receive Secretary DeVos's ".ed.gov" email address? Betsy DeVos, is this you?! I love how this Ellen woman just wants to talk and talk and talk but won't even acknowledge the comments and testimonies of others. If you can't propagate the conversation, then you add no additional value to your ideas. Hai, concerned reader! This is that Ellen woman. I work and I raise kids, so I jump in and comment when I can, as I did the other day. Thanks for stopping by! You seem exceptionally charming. Thanks for sharing - I just donated to Donorschoose.org - what a great organization.